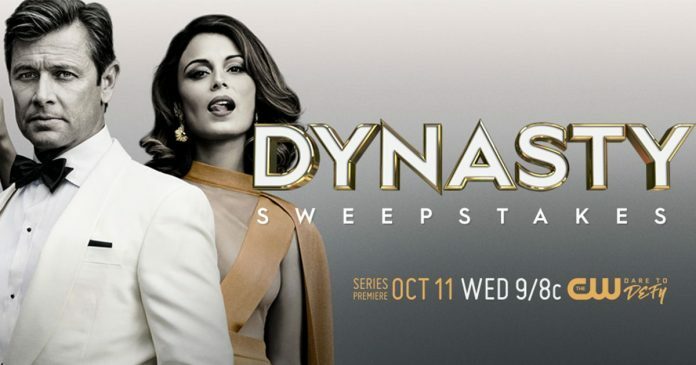 This Wednesday, October 11, follow the powerful Carrington family during the season premiere of Dynasty on The CW and enter the Sweepstakes at cwdynastysweepstakes.com for a chance to win a designer handbag, wallet, and watch, plus $500 to go shopping. To enter, log on to www.cwdynastysweepstakes.com during the Sweepstakes Period. Complete the entry form including email address, name, complete mailing address, telephone number, and local CW channel. Once completed, click on the “Submit Form” button to submit your entry. You will then be automatically entered into the random prize drawings. The CW Dynasty Sweepstakes ends at 11:59 PM PT November 30, 2017. Entrants must be permanent, legal residents of, and must physically reside in, one of the 50 United States or the District of Columbia and must be 18 years of age or older and of the age of majority in their state of residence as of the date of entry. Limit one entry per person and/or per email address, per day.